We are staying in a select area of Queens in a house built 75 years ago, that has had very little work done on it since that time. 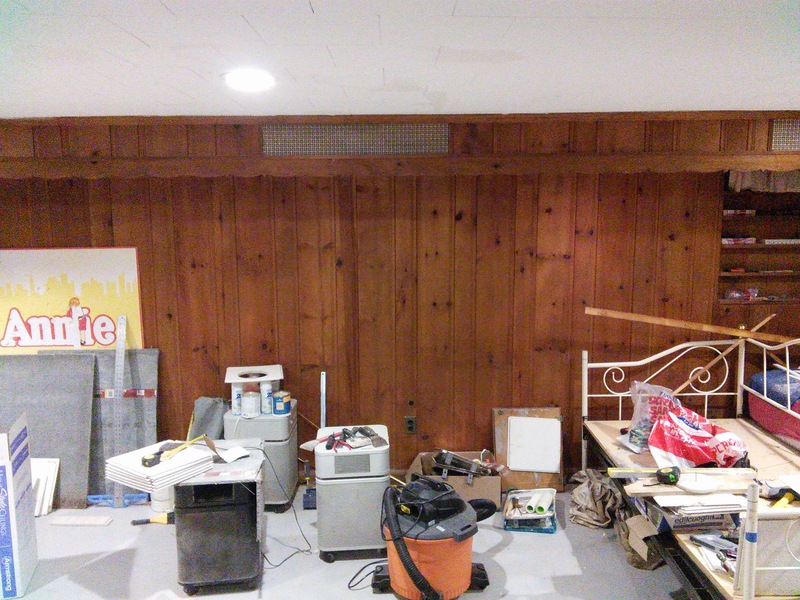 Our project is to revamp the basement so it can be raised to a standard where it can be let. Felix, the previous helpxer, painted the floor grey and he also slept there in a super king-size bed. We were asked if we could put up a wall and door at the foot of the stairs to separate the space from the laundry area, but the first thing we noticed was that the ceiling tiles were unevenly fitted, sagging and peppered with screw holes, a disaster left by previous ‘helpers’. So we offered to tackle that first. The basement is completely cluttered with the leftovers from other projects: numerous uncleaned paint rollers and brushes; roller trays (unwashed); half empty cans of paint, solvent, cleaner, filler, adhesive; screwdrivers; power tools, some of which work; bits of wood; several air conditioning units; old lamps; a life jacket; endless cables; a vacuum cleaner; etc. 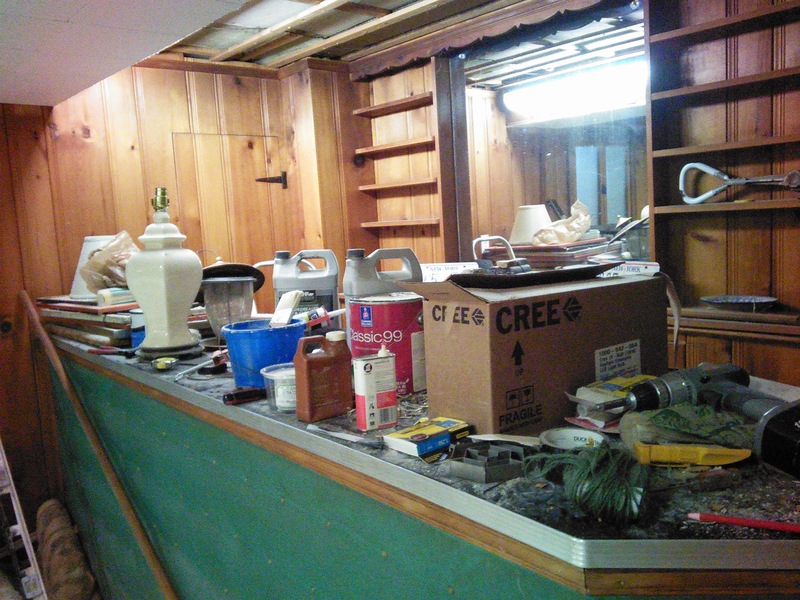 Needless to say, not an ideal workspace and one that would certainly not pass any health and safety inspection! Sean found out how to fix the ceiling tiles on YouTube and we went to Home Depot to buy supplies (mainly more tiles and a staple gun). We then set to removing all the tiles, salvaging as many as possible. Then we started to replace them, a task made harder by varying ceiling heights and recessed light fittings. 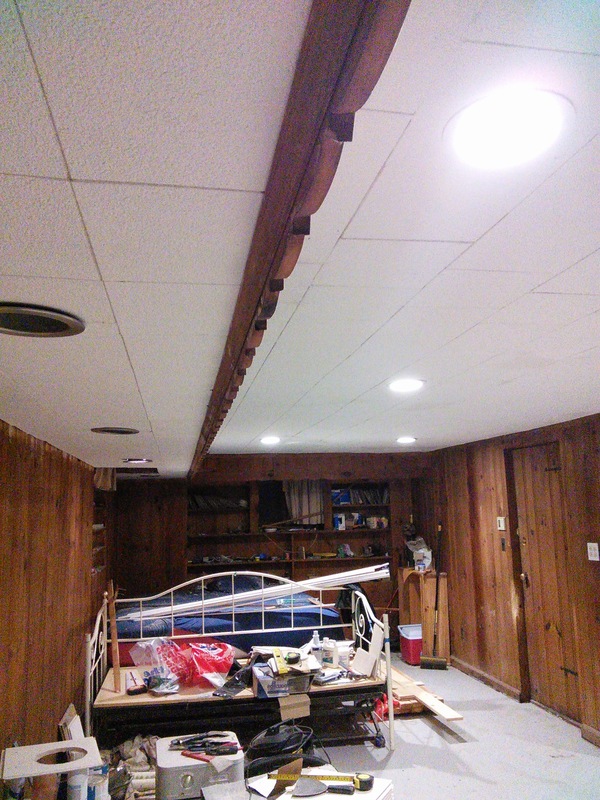 We filled any cracks and holes and painted the entire ceiling. We should finish it on our next work day and our next task will to build a stud wall and hang a door. When I say ‘we’ I suspect my contribution will be minimal. The good things about doing this have been that we’ve discovered we can work well as a team (Sean has been very patient with me! ), we can organise our own workload and time and it’s very satisfying to be able to complete a project. The frustrations are lack of suitable tools and the chaotic workspace (there’s not even a work bench). In return for our work we get our room, most of our food (though this can be a bit unpredictable), and an insight into American life that we could not get in any other way. This is where we’ve been working. backpacksandcraic Create a free website or blog at WordPress.com.